Could anything be tastier than this combo of bacon, cheese and leftover stuffing? 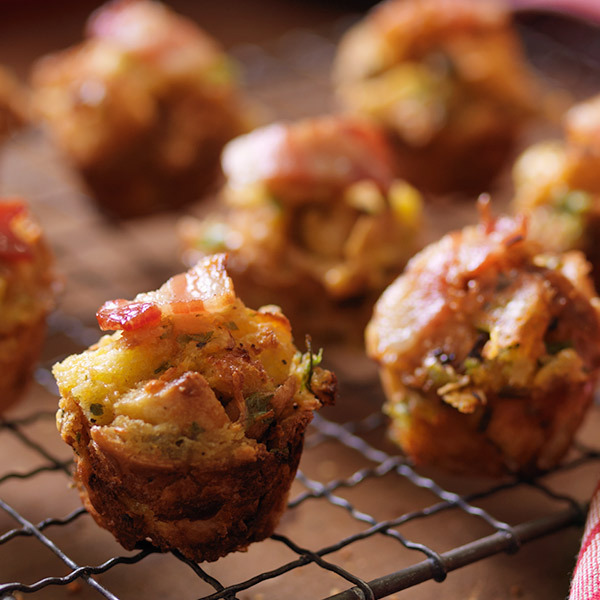 Whether you serve it as an appetizer or a side dish, our recipe for Bacon and Cheese Stuffing Gems is an inventive way to use your Thanksgiving leftovers with a new and delicious twist. You could even serve these mini muffins to your guests for breakfast the morning after Thanksgiving! Cut the bacon crosswise into ½-inch slices. You need 20 total. Discard any pieces that are all or mostly fat. Place the stuffing in a bowl, and break it up a bit with a fork. Add the cheddar and scallions, and toss well to distribute evenly. If the mixture is at all dry, moisten it with a little milk. Using a heaping tablespoon per “gem,” press the stuffing mixture into the gem cups. Top each with a piece of bacon. Bake for 15 to 20 minutes, until the bacon is cooked. Tip: If you don’t have a gem pan, you can do this in a regular 12-cup muffin tin (with smallish cups). Use the same amount of stuffing per muffin cup, and make more than one batch.